Floating on water is very relaxing. Even if you cannot swim very well, you can still benefit from the freedom of movement that you can get from just floating on water. It does not take much effort, floating on water; all you need to do is to lay back on the water’s surface and let the water carry your body. The water instantly washes away your cares and worries, and it lets you move in ways that you cannot move when you are on a solid surface. The relaxing effect of water on the body and the wider range of movement that water lets people do while floating on it is something that massage therapists have taken advantage of in promoting health and well-being with their clients. A particular technique has been developed that relies exactly on this, and it is called aquatic massage therapy. Aquatic massage therapy is done while the client is either floating or soaking in a therapeutic pool. 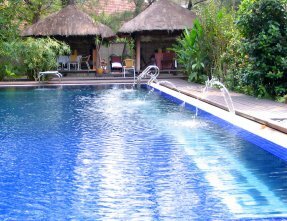 To further relax the body, the water in the pool is always kept at 95 degrees Fahrenheit. The heat of the water seeps into the skin and helps loosens the muscles. It also calms the nervous system and makes the patient feel good. Aquatic massage therapy is recommended for people who suffer from muscular ailments that limit their movements. Such ailments include, but are not limited to, arthritis, osteoarthritis and rheumatism. It is also done on patients who have sustained injuries after operation and nerve damage. This type of massage is also favored by pregnant women. It is also good for people who are afflicted by insomnia and other sleep disorders. In aquatic massage therapy, the patient is made to float or is submerged in the water. Sometimes, his or her legs are propped up in some form of support, like a pool-noodle or a paddle. The patient’s body is supported by the therapist, who massages the patient and coaxes him or her to make stretching movements. There are two main forms of massages that therapists use in aquatic massage therapy, namely watsu and Jahara. Watsu is derived from shiatsu, and so the strokes, the application of pressure and the stretches are all designed to activate the acupoints of the body and release the flow of energy through the body. Because water provides the body with a wider range for movements, the stretches are gentle and coax the body into increased flexibility, something that could be painful if done on solid surface. The second form of massage typically used in aquatic massage therapy is the Jahara massage. The Jahara massage is designed to help lengthen the spine. This is also done through joint stretches that are proven safe and gentle. The musculature of the body and the alignment of the spine are taken well into consideration in the performance of a Jahara massage in the water; all strokes and stretches are made to be suited to the body’s musculature and alignment. Aquatic massage therapy is great not just for relaxation but also for healing. Through aquatic massage, the body regains the freedom of movement that was taken from it. It makes the body more limber and flexible.